Folded dalhia by dungeon guilter. I din 't have enough. Material so I cut what I had into 21/2 inch squares this is the result. So try a jelly roll to make these flowers. I did starch the fabric before I started and will press and starch again..
Can you see the mistake. great idea with a jelly roll! That turned out beautiful. fabulous fabric! That is beautiful and a lot of work. That flower is on my "bucket list". Very nice - I like it !! Very similar to my Avatar !! It's gorgeous!! What a great idea. Nice! the only mistake I see is that it is not being sent to me. 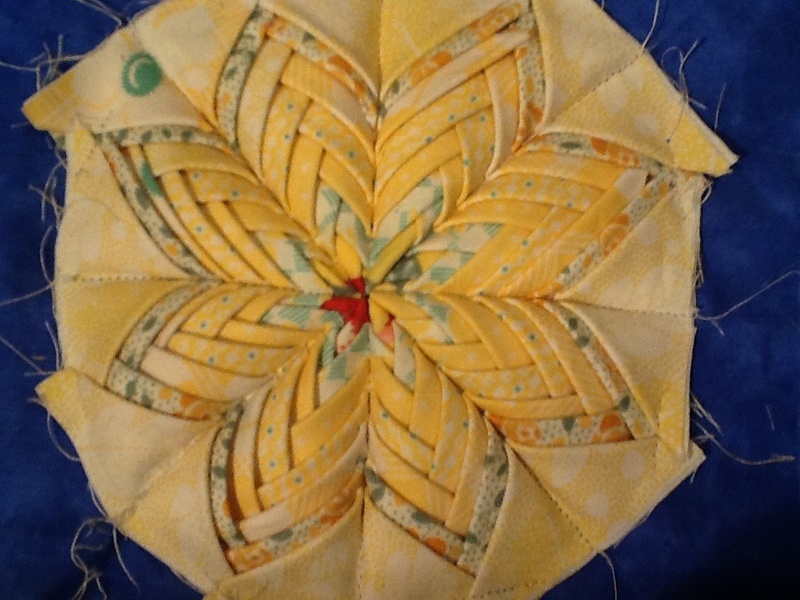 I love making the folding star ornaments and this is the same except you are doing it flat instead of on a round ball. There are so many variations by the size of the prairie points and their placement. This pattern makes great decorative potholders that sell fast at craft shows.